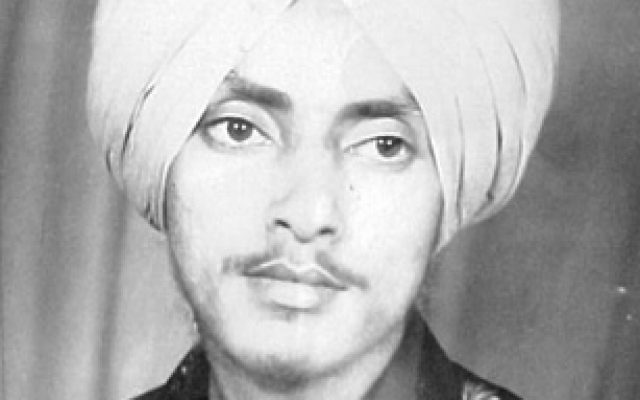 Shaheed Bhai Jarnail Singh Halwara was born in village Manak Majra which is located approximately 3 miles from Mandi Gobindgarh, District Ludhiana (now presently in territorial jurisdiction of District Fatehgarh Sahib) in the month of January, 1961, into a small farming family. Bhai Sahib was born into the household of Mata Mohinder Kaur and Sardar Harbant Singh. He was the youngest among four brothers and three sisters. Bhai Sahib’s family moved to village Halwara, District Ludhiana, where he completed his primary education at the local village school. Bhai Sahib was a keen and talented basketball player; he even represented Punjab in the inter-state school basketball games held in Bhilwara, Rajasthan. Bhai Sahib took admission in the sports wing at the Govt. College in Ludhiana. Prior to his first year examinations Bhai Sahib left college as he felt he could serve a higher purpose in life. Bhai Jarnail Singh began taking interest in religious and political affairs. Bhai Sahib became a member of the Guru Gobind Singh Study Circle, in which he contributed to the monthly journal of the study circle. Bhai Sahib was blessed with Amrit in the year of 1982. It was in this year that the religious-political scene had reached boiling point in the aftermath of the acquittal of Nakli Nirankaris involved in the massacre of the pious Sikh jatha who had peacefully marched to protest the cult’s repeated insult of Sikh Gurus and faith. Bhai Sahib had built close relations within the leadership of the Sikh Students Federation which worked in close co-operation with Sant Jarnail Singh Khalsa. Bhai Sahib became an active member of the SSF and often participated in peaceful protests against the atrocities being carried out upon his fellow Sikhs. For this reason Bhai Sahib was arrested but was released one month later. After his release, Bhai Sahib moved to Golden Temple complex to continue with his activities with the SSF. Bhai Sahib went underground just two days after his release from prison. Bhai Sahib became one of the leading persons to revive the movement after the blow of Operation Bluestar. Bhai Sahib always selected, planned and executed his targets with utmost wisdom and skill. It is not possible to attribute the exact number of militant operations to Bhai Sahibs name as he never publically claimed responsibility for any action (as a show of humblesness). Only the police files and further newspaper reports can throw some light on these aspects. However, one action which Bhai Sahibs name has become attached with is the assassination of Harchand Singh Longowal in the Akal Parkash Gurdwara at Sherpur in Sangrur District, on August 1985. After the assassination of Harchand Singh Longowal, the Hindustani forces were frantically searching for Bhai Jarnail Singh; Bhai Sahib’s family was constantly harassed by the Indian Agencies trying to find clues of Bhai Sahib’s whereabouts, but to no avail. During the assassination of Harchand Singh Longowal, some of Bhai Jaranail Singh’s companions were arrested. Bhai Sahib hatched a plan to free his companions; Bhai Sahib bought a house located near Sangrur jail, where his fellow Singh’s were being held captive. However, the plan was leaked and Bhai Sahib was not able to carry out his task. Bhai Jarnail Singh lived and attained supreme sacrifice for the Sikh Nation, which was his avowed mission. At one time DGP Riberio claimed the militancy could be controlled just with arrest of Bhai Jarnail Singh Halwara and Bhai Gurjit Singh of SSF. Bhai Sahib is said to have been connected with most of the leading militants, such as Bhai Gurjant Singh Budhsinghwala (KLF), Bhai Charanjit Singh Channi (Talwandi Rai), Bhai Varinder Singh Dakha (Bhai Jarnail Singh himself had convinced Bhai Varinder Singh Dakha to join the freedom struggle), Bhai Iqbal Singh Babbar, Bhai Gurpal Singh Babbar and many brave warriors who have gone to the gallows for the common cause of the Sikh Nation. Bhai Sahib was killed along with Bhai Gurpal Singh Babbar on the dawn of May 11, 1987 in Haripur, District Sangrur when the police surrounded the house where he and Bhai Gurpal Singh Babbar had spent the night. Bhai Gurpal Singh Babbar attained Shaheedi (Martyrdom) whilst battling with the police. Bhai Sahib attained Shaheedi when was shot after attempting to escape subsequent to freeing himself from police officers who wanted to arrest him alive. Two of his associates are said to have escaped from the scene whilst retaliating with the police. After their Shaheedi countless Singh’s gathered at Bhai Gurpal Singh’s house and did an Akhand Paath and Akhand Kirtan, which was done in great Chardi Kala (High Spirits). The village of Halwara made a new Gurdwara in honour of Shaheed Bhai Jarnail Singh Halwara. In Bhucho Mandi even today there is a Gurdwara Sahib that has the pictures of Bhai Gurpal Singh Babbar and is kept in his memory (though the name of the Gurdwara has been changed since). Bhai Sahib had an award of 150,000Rs on his head which was highest of the time. Bhai Sahib’s contribution and popularity could well be measured by the police arrangements made to keep masses away from his final rites ceremony. All the routes leading to village were closed for all traffic. The venue of ceremony was encircled by heavily armed police officers and fields were patrolled by police on horseback. Two DIG ranks were in overall charge supervising the Punjab police and Para-military arrangements. Despite all these provisions made by the Indian forces, Sikhs from all over Punjab flooded to village Halwara, to pay respect to Bhai Sahib. Onlookers were amazed to see the huge number of people who had come to attend Bhai Sahib’s final rites; it was as if the whole of Punjab had gathered to pay their respects to their fallen hero. The number of people that had assembled after Bhai Sahib’s Shaheedi confirmed that the Freedom Fighter’s had the sympathy and full backing by the people of Punjab.